They are competing in a crowded market dominated by the likes of James Wellbeloved, Arden Grange, and Burns, with lots more brands nibbling away at the big boys' heels with better value for money. Unfortunately, Barking Heads is actually more expensive than its major competition, and really only has its excellent marketing to rely on to enable it to compete. 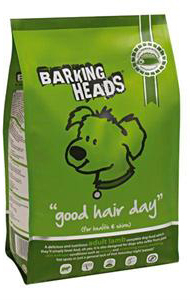 Barking Heads contains a good selection of natural ingredients throughout its range. If you can afford it, then you'll probably be pleased with the product. 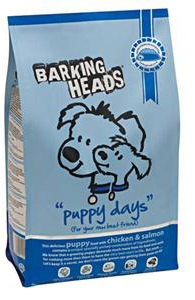 Although it is good, you can pick up a bag of natural dog food for much less than the price of Barking Heads, which is why we rate it lower than maybe the ingredients suggest. Fresh Lamb (min 26%) White Rice (min 26%) Dried Lamb (min 26%) Ground Oats Lamb Fat Salmon Oil Whole Linseed, Minerals, Dried Tomato, Natural Seaweed, Glucosamine, Chondroitin, MSM, Vitamins.